The markets continue to shrug off concerns about the ongoing trade dispute between the United States and China. However, one major retailer sounded the alarm this week. Executives at Walmart Inc. (NYSE: WMT) sent a letter to U.S. Trade Representative Robert Lighthizer. According to Reuters, the letter detailed how the retail giant may need to raise prices as a result of tariffs on Chinese imports. In deal news, Adobe Systems Inc. (NASDAQ: ADBE) announced it will purchase marketing firm Marketo from a private equity firm for roughly $4.75 billion. The deal will make private equity investors at Vista Equity Partners quite happy, and Adobe will get one of the fastest-growing marketing platforms to add to its digital marketing business. Crude oil prices were on the rise ahead of a major meeting between members and non-members of OPEC. The meeting is expected to focus on production hikes in the wake of U.S. sanctions restricting Iranian exports. With oil prices hovering near $80 per barrel, U.S. President Donald Trump has criticized OPEC's "monopoly" and said that Middle Eastern producers push prices lower. Trump has even hinted that he is considering a reduction in U.S. military in the region should prices fail to decline. Apple Inc. (NASDAQ: AAPL) will lead today's headlines. 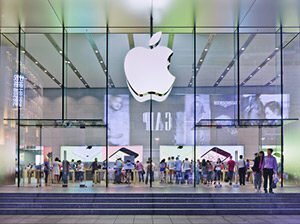 The company's latest iPhone models will hit stores, and investors will be watching the sales register for clues of what's ahead of the stock. The company has launched the 5.8-inch iPhone XS (starting at $999) and the iPhone XS Max (starting at $1099). The less expensive iPhone XR ($749) doesn't hit U.S. stores until October. Shares of Micron Technology Inc. (NASDAQ: MU) fell more than 4.2% in pre-market hours despite news that the Chinese semiconductor giant topped earnings expectations after the bell. Although the firm reported EPS of $3.53, which beat consensus expectations by $0.19, the market turned bearish on the stock after its executives issued a dire warning. The stock erased gains after the firm said that U.S. tariffs would impact the company's bottom line for up to one year. Shares of McDonald's Corp. (NYSE: MCD) are in focus after the company hiked its dividend by 15%. The fast food empire raised its quarterly payout from $1.01 to $1.16, marking the 42nd straight year that it has increased its dividend. If you're looking for other great income stocks, we've got you covered. We've just unveiled our list of the best three income stocks to own in September. You can read it for free right here.